I love fairy tales. I have always loved fairy tales. I have fond memories of, far past the point of being able to read complicated books, sitting in the library reading picture books of fairy tales. I love the lavish illustrations, but I also like reading many different versions of the same story. These days I still like doing that, but now I like learning why and where the different varients of Cinderella or the Twelve Dancing Princesses come from. 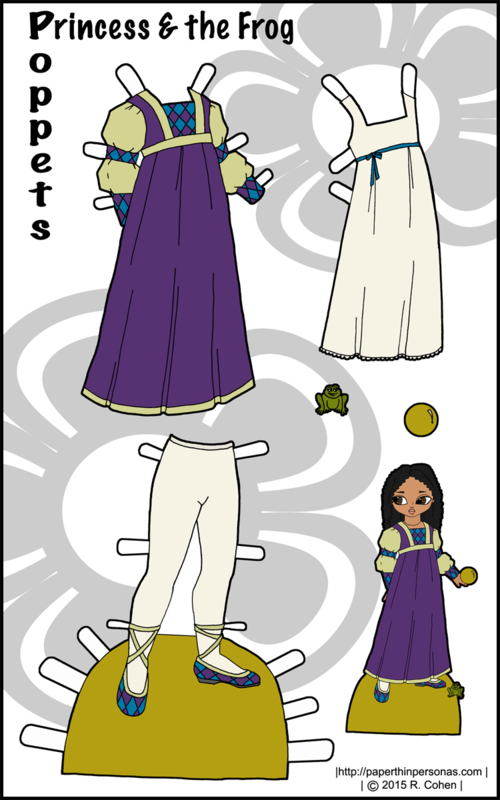 Today’s paper doll set is an ode to one of my favorite fairy tales. The Frog Prince or The Princess and the Frog, depending on which version you read. A princess loses her beautiful golden ball down a well and a frog retrieves it for her only if she will marry him. She agrees and then backs out of her promise. The story goes from there. Disney did an interesting adaption of the tale recently, but I will always picture the Princess how she was drawn by Walter Crane in the Frog Prince. Walter Crane is one of my favorite children’s illustrators. 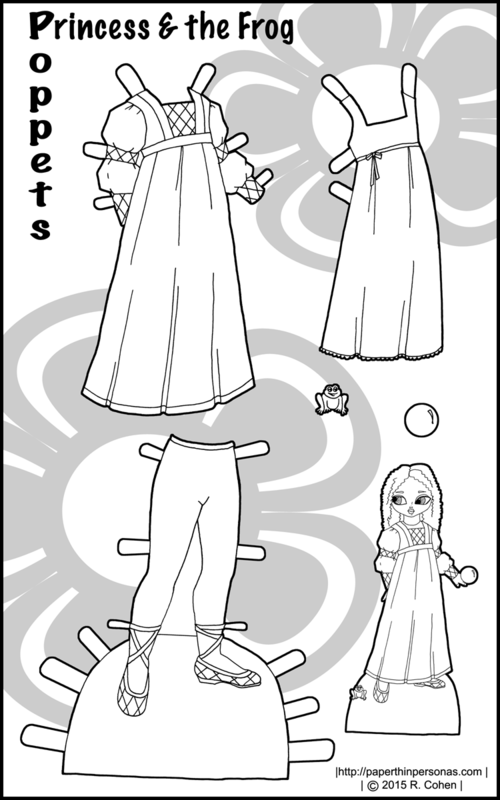 I was inspired by the pseudo-renaissance look for my own paper doll’s costume. So, there is a frog, a golden ball, and a beautiful gown for the Princess. I am not much an animal artist, but I did my best to make my frog cute and palm sized. I always thought the Princess in the Frog Prince was a little spoiled, but then I suppose that’s just how fairy tales go sometimes. Very interesting the frog prince is also one of my favorites. Disney based their version off the Frog Princess by E.D. Baker. These are SO cute! Will there be more Poppet outfits coming soon? I’m sending some of these to one of my sponsored girls for her birthday… Petal to represent her and Poppy to represent me! (Red hair and all!) I’m sure she’s going to adore them! Honestly, I don’t know. I hate to promise things and not deliver, but I am so glad you enjoy the Poppets.